I used two of these for my cross cut sled I just made. At 5.99 each, they looked like a good value. I was unable to find many reviews on line, so I figured I would give them a shot. I don’t like the design. These have two locking mechanisms. There is a knurled knob at the bottom that locks the bolt to the track. After locked to the track, you slide the clamp on and screw down the knob. It’s very diffucult to get at the little knurled knob without completely unscrewing the top knob and removing the clamp. Also the small knurled knob is 100% plastic – even the threads. I don’t think this was designed to be moved around much. I have a few of the bolts/knobs from woodpeckers and they are awesome. Woodcraft only had one of these in stock and I wanted a matching set. 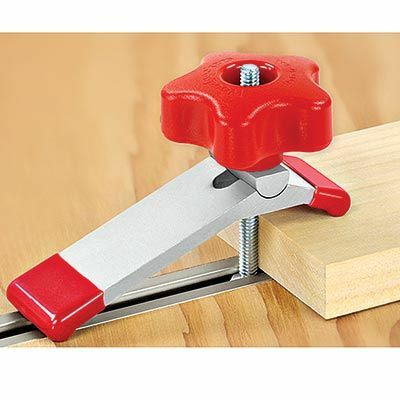 There is only one clamping mechanism on the woodpeckers – no need to clamp to the track and the work piece. This makes adjustments A LOT easier. Rockler makes two T-track hold downs. One is 3-1/2”x3/4” for $5.29. the other 5-1/2”x3/4” for $8.29. I have a set of the smaller pair that I use constantly on my drill press table. Had them for about two years now. They work great, no complaints. I’ll be picking up the larger set next time I’m in Rockler. thanks for the tip!, I’ll check those out. I have made my own to match the Incra style and I much prefer to have my own home made clamps.. I am a wood nut.. and enjoy making things like these..